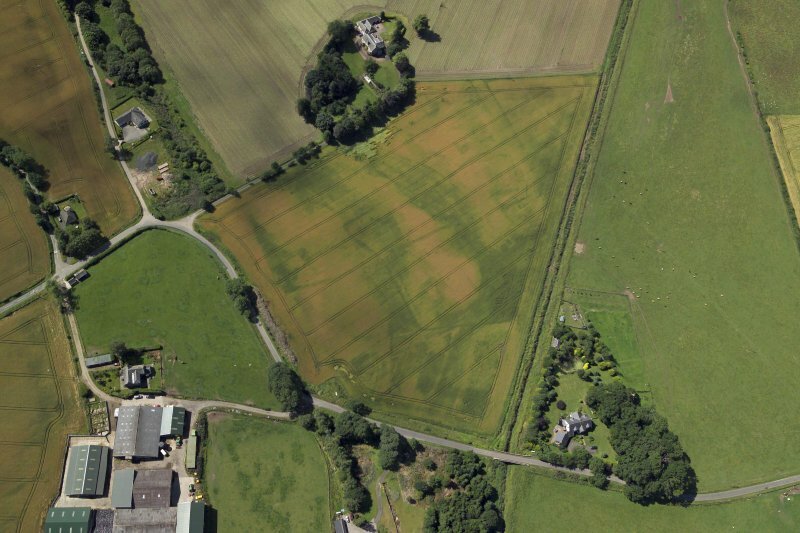 Oblique aerial view centred on the cropmarks of the enclosures and possible building with the manse and remains of the abbey adjacent, taken from the WNW. 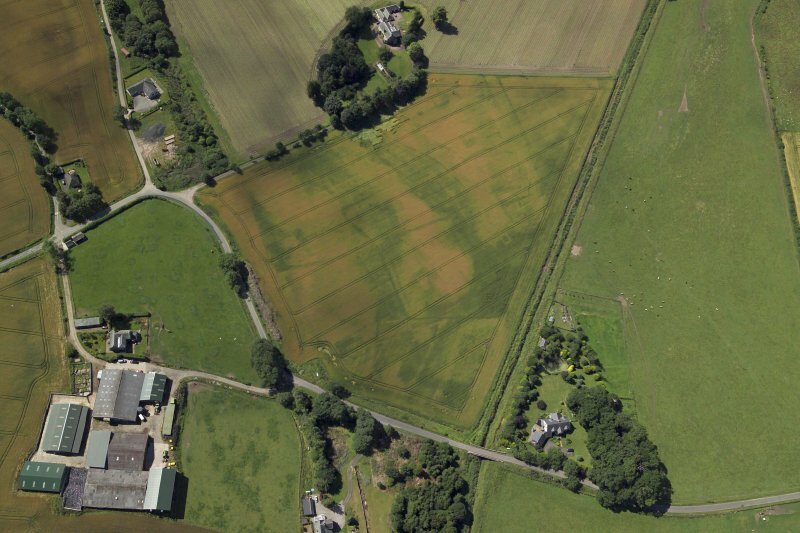 Oblique aerial view centred on the cropmarks of the enclosures and possible building with the manse and remains of the abbey adjacent, taken from the NNE. 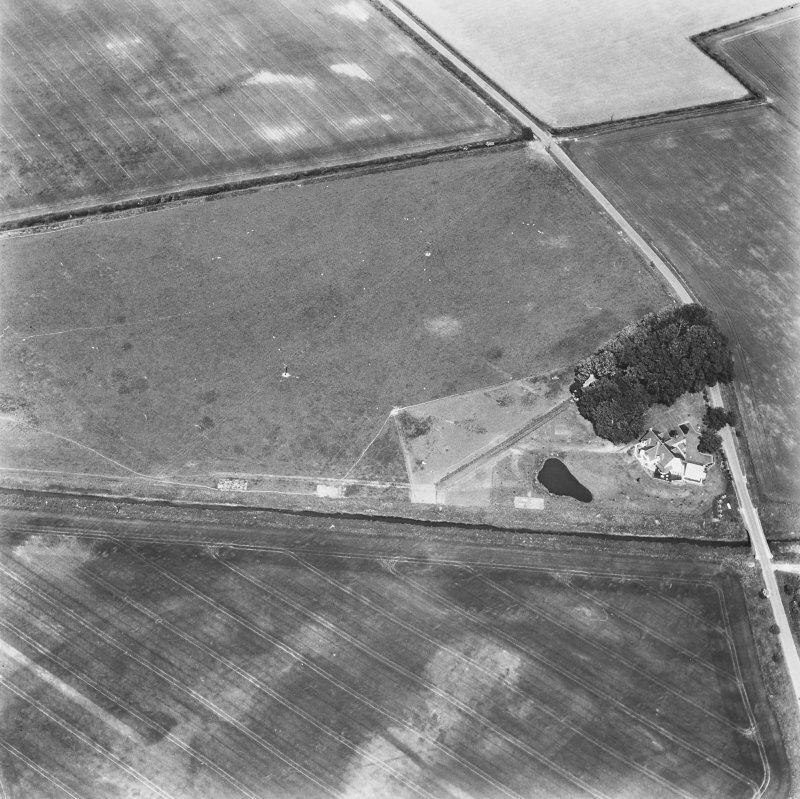 Oblique aerial view centred on the cropmarks of the enclosures and possible building with the manse, farmsteading, farmhouse and remains of the abbey adjacent, taken from the E.
Oblique aerial view centred on the cropmarks of the enclosures and possible building with the manse, farmsteading, farmhouse and remains of the abbey adjacent, taken from the WSW. 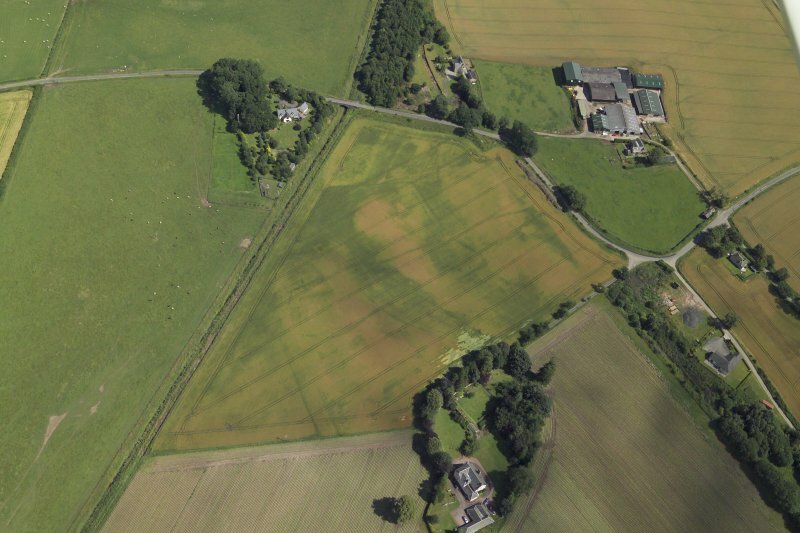 Oblique aerial view centred on the cropmarks of the enclosures and possible building with the manse and remains of the abbey adjacent, taken from the NW. 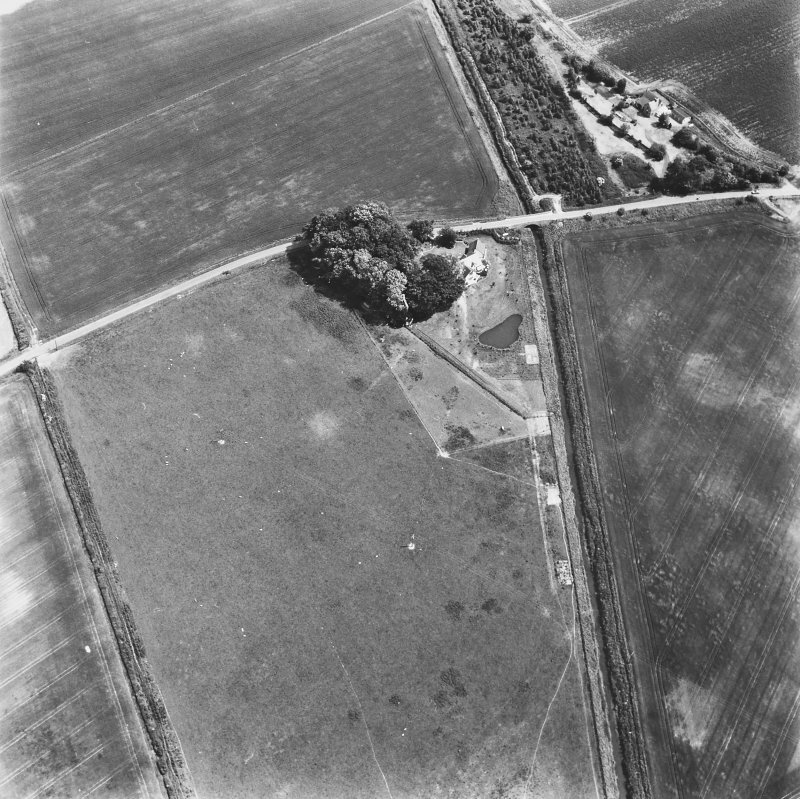 Oblique aerial view centred on the cropmarks of the enclosures and possible building with the manse and remains of the abbey adjacent, taken from the NE. 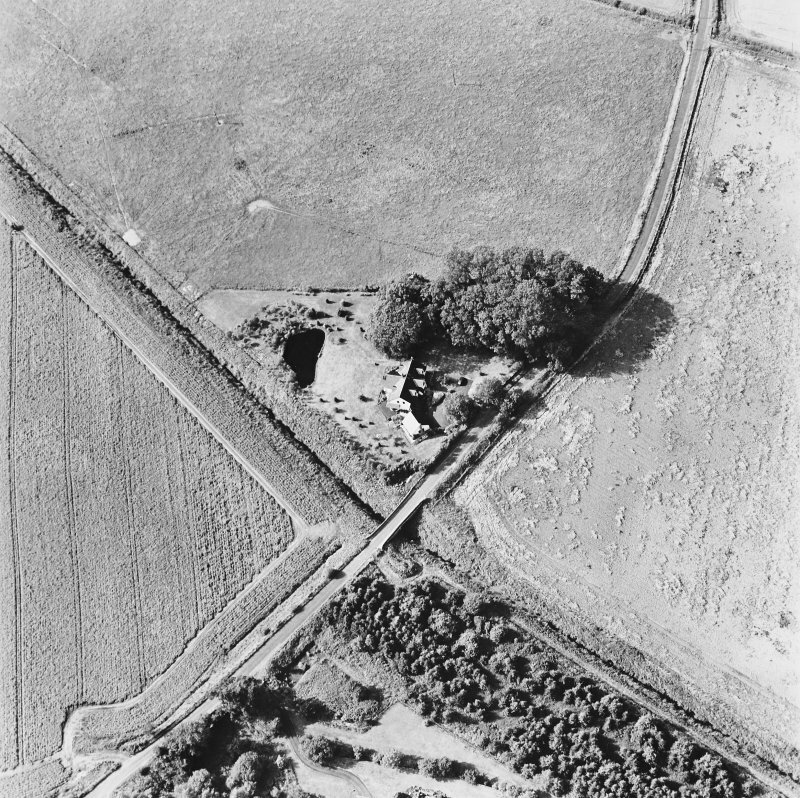 Inchaffray Abbey, oblique aerial view, taken from the NW, centred on the remains of the abbey. 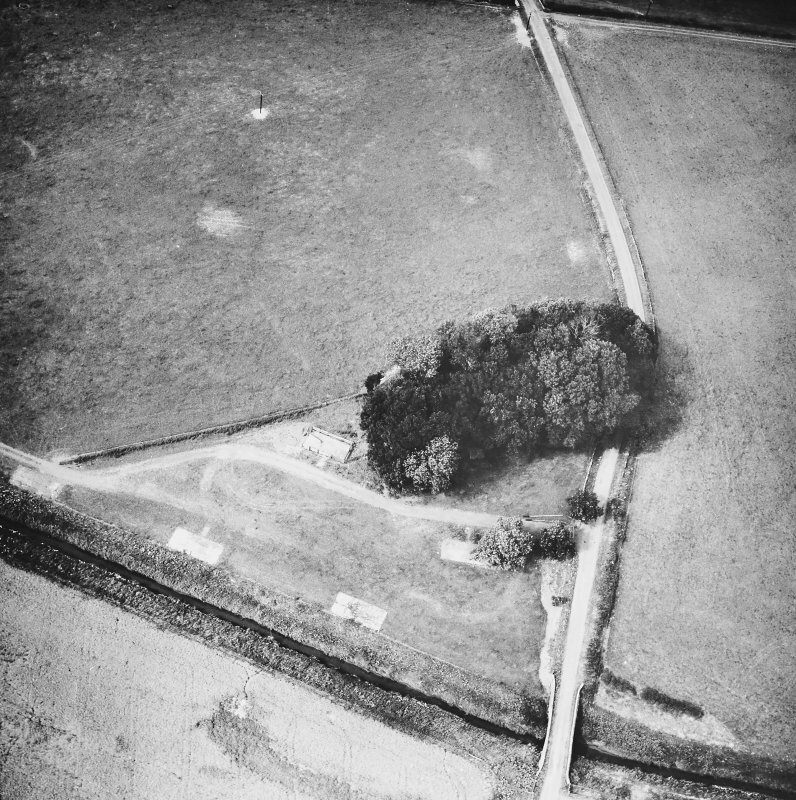 A road bridge is visible in the centre of the photograph. 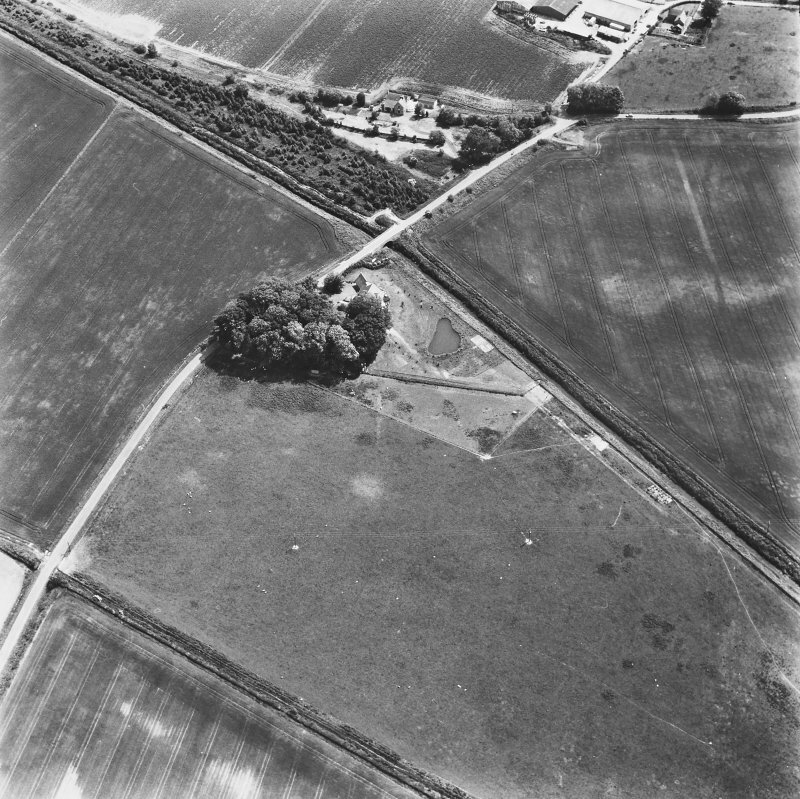 Inchaffray Abbey, oblique aerial view, taken from the SE, centred on the remains of the abbey. 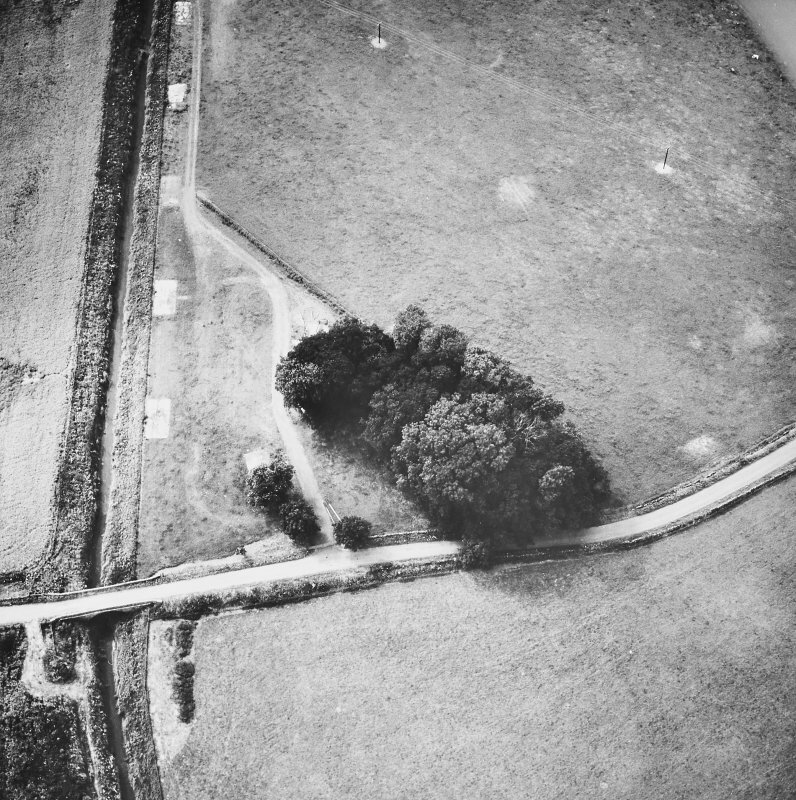 A road bridge is visible in the bottom centre of the photograph. 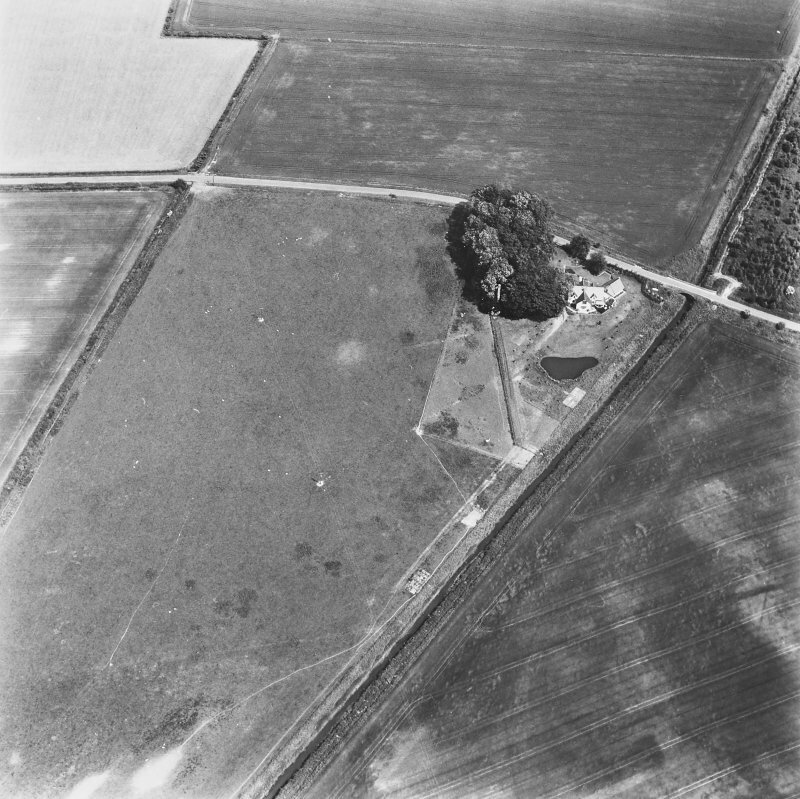 Oblique aerial view centred on the cropmarks of the enclosures and possible building with the manse, farmsteading, farmhouse and remains of the abbey adjacent, taken from the W.
Inchaffray Abbey, oblique aerial view, taken from the NE, centred on the remains of the abbey. 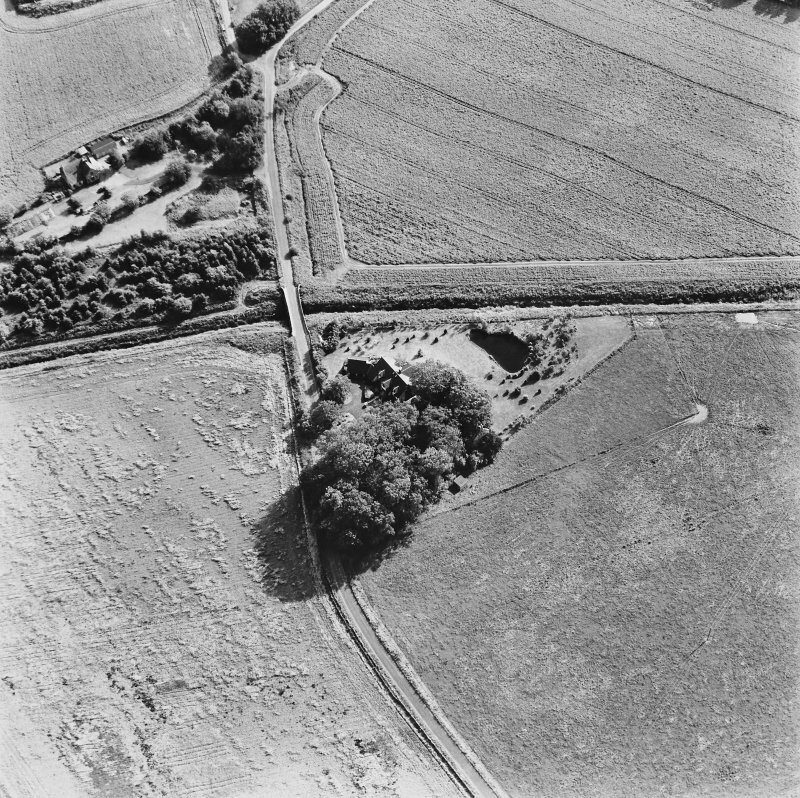 A road bridge is visible in the centre of the photograph. (NN 9536 2251) Inchaffray Abbey (NR). 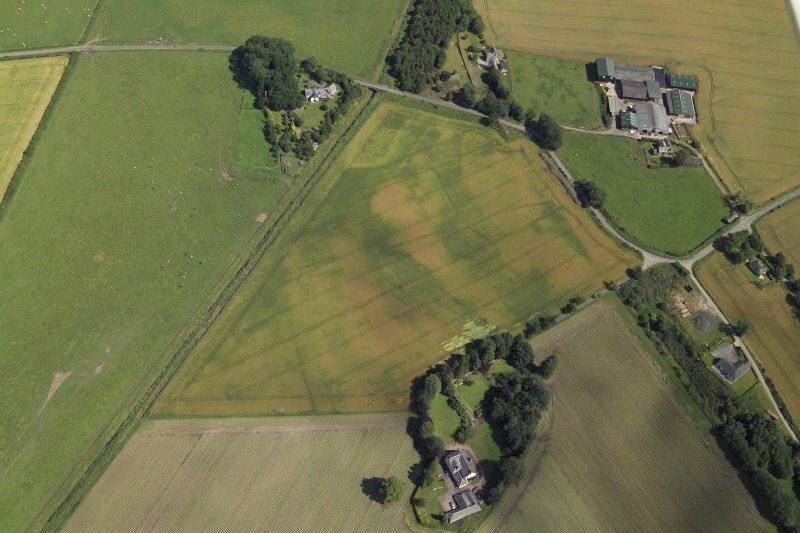 The ruins of the Abbey of Inchaffray, the ancient Insula Missarum, stand on a wooded mound not far from Madderty Station, about 6 miles E of Crieff. The abbey was founded by Gilbert, Earl of Stratherne, who succeeded his father, Earl Ferteth, in 1171 and died in 1223, and his first wife, Matildis, the daughter of William de Aubegni. 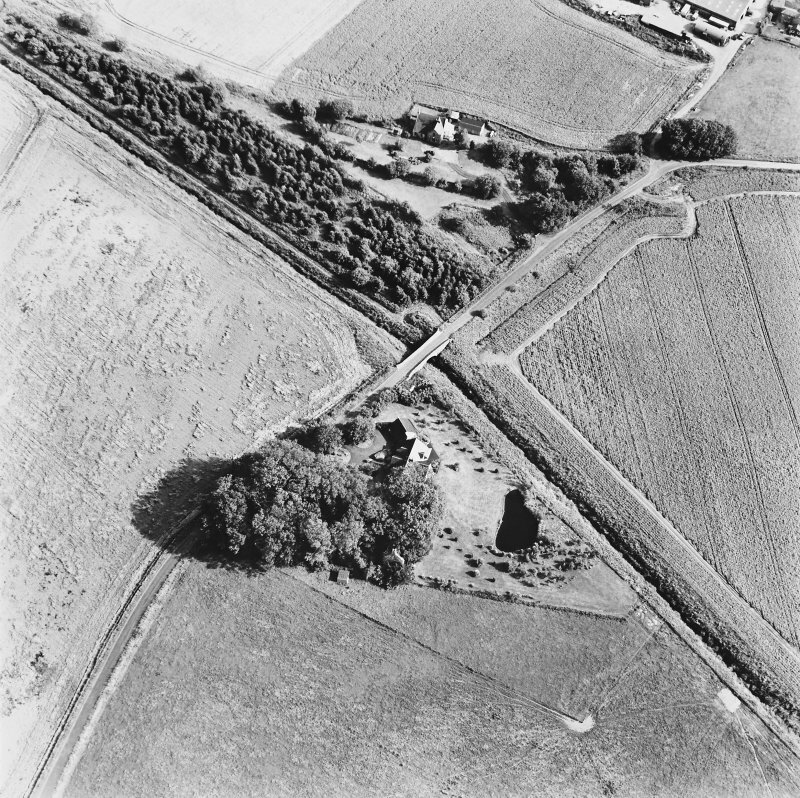 Their eldest son, Gilchrist, was buried in 1198 at Inchaffray, which had been founded before that date. In 1200, when the great charter of the abbey was granted, the Earl and Countess endowed it with various churches, including St Mechessock of Ochterardouer and St Beanus of Kynkell. They declared their affection for Inchaffray, affirming 'so much do we love it, that we have chosen a place of sepulture in it for us and our successors, and have already buried there our eldest born'. The abbey was dedicated to St Mary the Virgin and St John the Evangelist, and was a house of the canons regular of the order of St Augustine. Although not reckoned as one of the great monasteries of Scotland, it was 'endowed with many privileges and immunities by David and Alexander, Kings of Scotland', but its principal benefactors were the family of the Earls of Stratherne, Earl Robert, the son (1223 and 1231) of Gilbert being particularly liberal. Only one of the abbots, Abbot Maurice, has obtained any popular recognition in history. It was he who blessed the Scottish army at Bannockburn. Five years afterwards he was promoted to the See of Dunblane, within which diocese Inchaffray is situated. The first head of the house was Malis, a religious hermit, in whose piety and discretion Earl Gilbert and Matildis had full confidence. At the Reformation, Inchaffray suffered the usual fate. Alexander Gordon, brother of George, fourth Earl of Huntly, was made commendator in 1553. Five years later he was promoted to the See of Galloway, and shortly afterwards he was accused, by the General Assembly, of neglecting his duties, and in particular, that he resigned Inchaffray in favour of a young child and set divers lands in feu in prejudice of the kirk. The young child was James Drummond, son of David, Lord Drummond of Innerpeffray, in whose favour the abbey was erected into a temporal lordship. The ruins of the abbey are situated on ground which rises slightly above the surface of the valley. 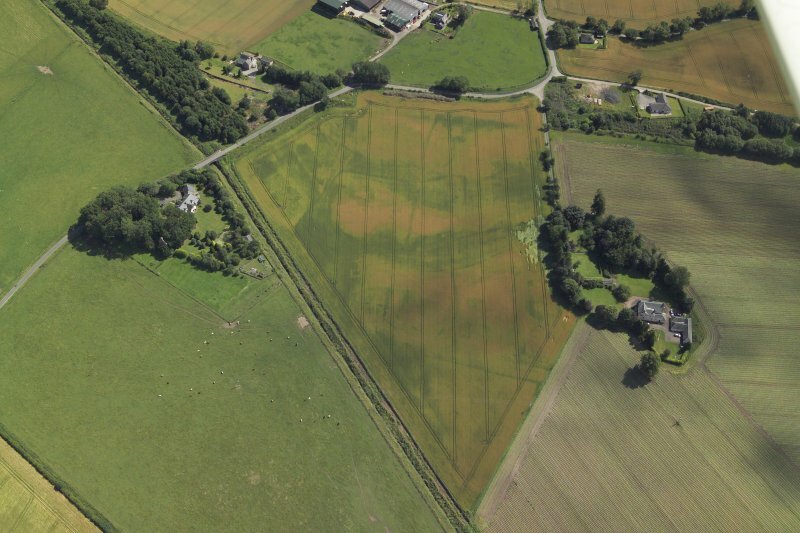 The valley in ancient times was a great marsh extending for many miles, and it was from this feature that the abbey received the name by which it was very generally known throughout the Middle Ages of 'Insula Missarum' or Isle of Masses. As early as the year 1218 the monks had reclaimed a portion of this marsh, and they doubtless continued their labours; but it was not till 1696 that an Act was obtained under the authority of Parliament for dealing effectively with it. 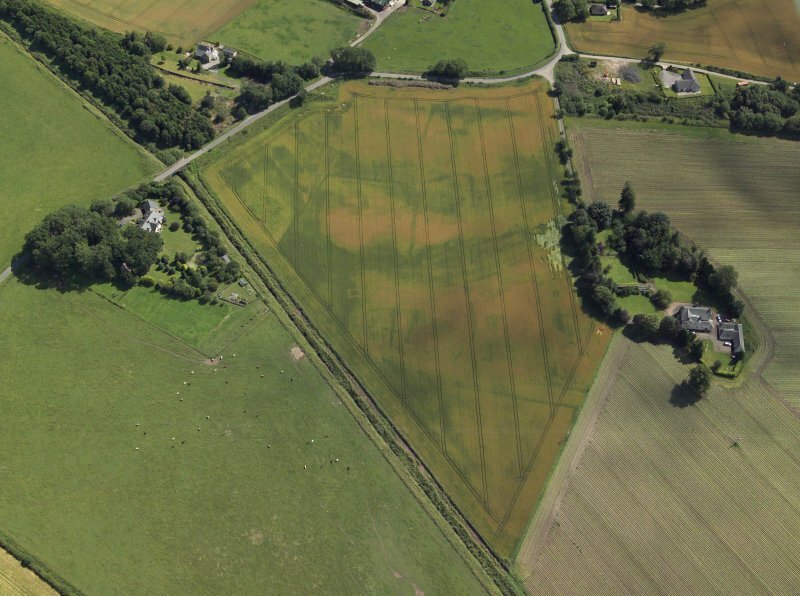 The fields around the abbey are now all cultivated and the ruins are enclosed with tone dykes so that the few fragments which remain are now properly protected. Within the dykes almost nothing is visible but a dense mass of trees and brushwood with mounds of ruins in the utmost confusion. A gable at the NW corner stands entire with a round-arched vault adjoining about 21 ft (6.4m) by 10 ft 6 ins (3.2m) wide and 10 ft (3m) high. This is one of the cellars of the W range of buildings. The walls of this range are fairly entire along their whole length for a height of 7 or 8 ft (2.1 or 2.4m) and the S end wall is also standing for about the same height. The length of this range from N to S is about 97 ft 7 ins (29.8m). It is probable that the adjoining cellar to the S is entire, but the place is so covered with vegetation that little can be ascertained. The doorway entering from the cloister to the NW cellar is undoubtedly of an early date. Not much of it remains, but enough to enable a plan to be made. The nook shaft, a fragment of the capital of which exists, is not later than the beginning of the 13th century. The high gable adjoining is certainly in part at least of a later date; the upper part and the chimney, with its corbelled cope, being of the 16th or 17th century. On the first floor, there has been a large fireplace, the flue of which is still partly visible. A large part of the N wall of the cloister stands near the gable. This was part of the S wall of the church, and the greater portion of the church would thus be situated outside the present enclosing dyke on the N side. There are indications at the NE corner of the surviving gable having extended northwards, which was probably the W wall of the church. At the junction of the S wall of the church and the wall of the W range, and at a height of about 15 ft (4.6m) above the ground, there still exists the corner corbel for supporting the wall of the cloister walk. We can remember when there were other corbels along the church wall also, but they have now disappeared. The part of this wall now standing is in a very precarious state. It evidently extended eastwards for about 120 ft (36.6m) when it met a cross wall, now represented by a mass of rough masonry now 7 or 8 ft (2.1 or 2.4m) square. This may represent one of the great piers of a central tower. 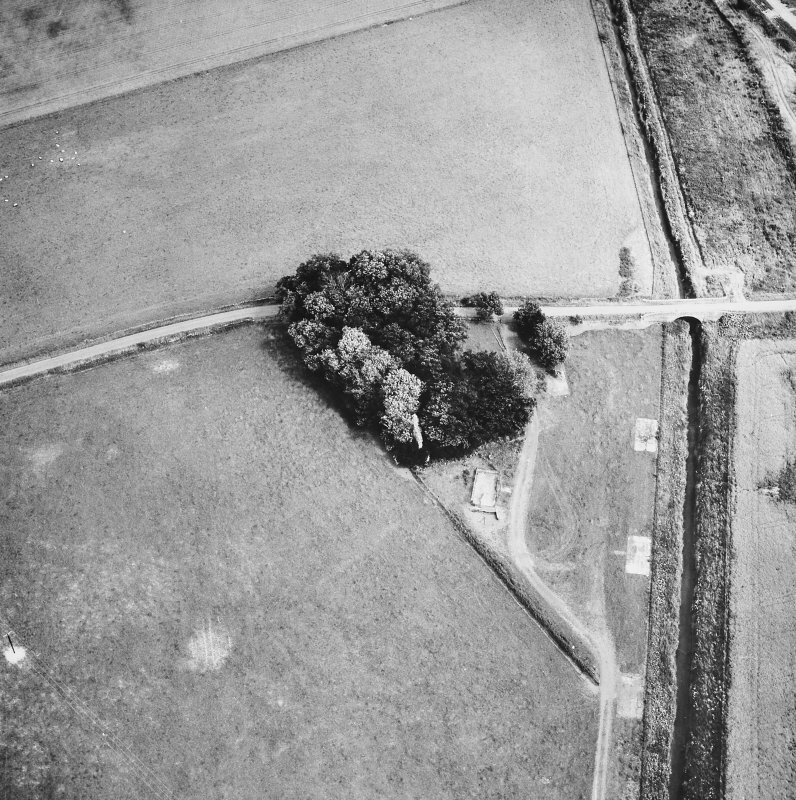 There are other pieces of masonry throughout the enclosure with numerous trenches and mounds, but owing to the rank vegetation it is impossible to make a more satisfactory plan. If the place were cleared out and a judicious search made, considerable remains would doubtless be found. The average length of the enclosure as it now stands is about 210 ft (64m). D MacGibbon and T Ross 1896-7. 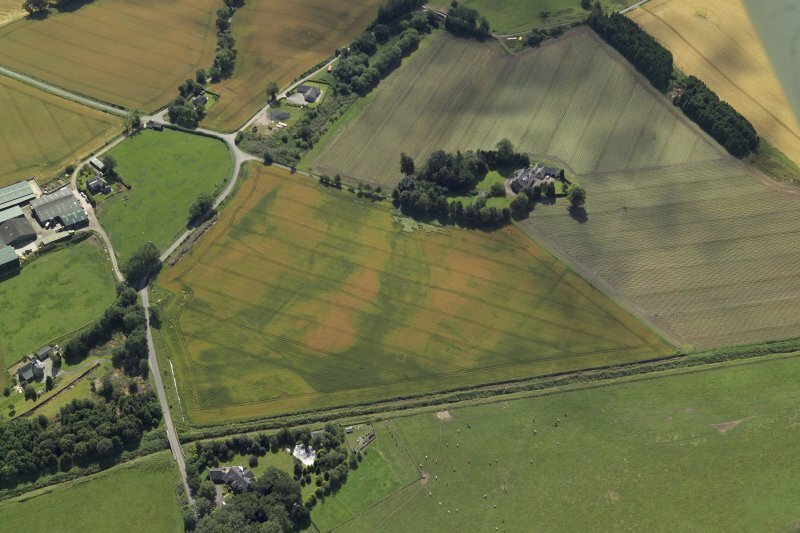 Originally the site of a Celtic community called, in 1200, 'the brethren of St John of Strathearn'. Founded as an Augustinian priory in 1200, it became an abbey in 1220 or 1221. From 1495 the abbey was in the hands of commendators. It was erected into a temporal lordship in 1609 but this did not finally take effect until 1669. The abbey was dedicated to St Mary the Virgin and St John the Evangelist. The remains consist of the western range of buildings of which the walls stand to a height of 7 or 8ft, and part of the south wall of the church which also formed the north wall of the cloister. D MacGibbon and T Ross 1897; D E Easson 1957. The abbey remains are generally as described, planned and illustrated by MacGibbon and Ross. The south wall of the church, however, although reduced to foundation level, remains for most of its length. The grass-covered foundations of structure to the south and east of the east corner of the church may be associated with the abbey, but may be later. Resurveyed at 1/2500. Visited by OS (EGC) 12 January 1967. Gilbert, Earl of Starthearn, in founding the Augustinian house c. 1200, provided that Mael-Isu, presbyter and hermit, would administer the new foundation and that those who were associated with him would be instructed in the service of God according to the rule of St Augustine. The community is referred to as the fratres of St John of Strathearn and therefore presumably not Celi De, but ordinary clerics comparable to those at Deer. The Augustinian priory itself is said to have been colonised from Scone, but the first prior, Mael-Isu, who is described as 'presbyter and hermit' and entrusted with the selection of the first members of the new community, may also have been joined by other members of the former community. It became an abbey in 1220 or 1221. On 11 June 1237 a bull of Pope Gregory IX contemplated the transference of the see of Dunblane to Inchaffray, the canons of which were to have the election of the bishop, but this did not take place. Abbot George Murray granted a letter of bailiary in favour of Laurence Lord Oliphant, 25 January 1468/9, who, on the abbot's resignation, was provided as commendator 16 November 1495. The abbey thereafter remained in the hands of a series of commendators; the community consisted of approximately fourteen canons at the Reformation. On 26 July 1565 the commendatorship was conferred upon James Drummond, in whose favour, as Lord Maddertie, it was erected into a temporal lordship, 31 January 1609. This did not take place, and the erection was not finally made until 15 February 1669 in favour of William Drummond, later Viscount Strathallan. In advance of proposed private house construction, a total of six trenches were excavated over four weeks in April in order to establish the general limits of the main abbey buildings and to clear the site of the new building of archaeological remains. 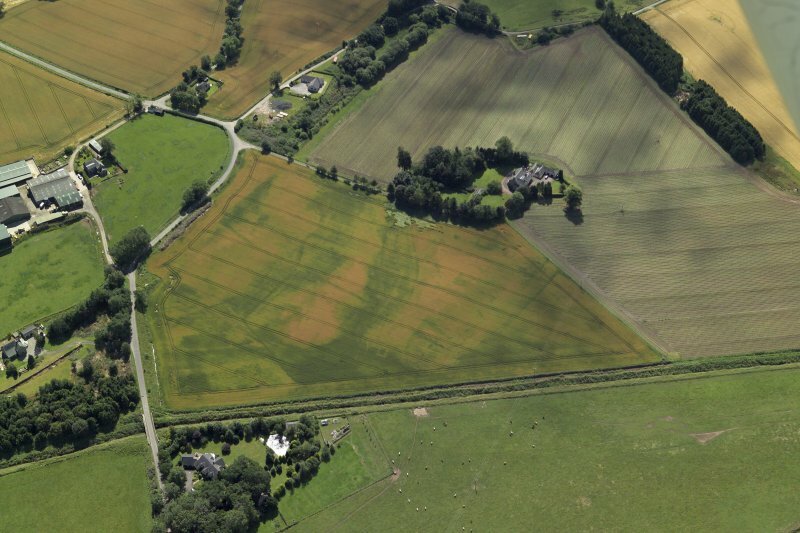 The latter saw the excavation of the SW corner of the claustral ranges which were found to be almost completely robbed out, although there was evidence of substantial rebuilding during the 15th and 16th centuries. Excavation to the N of the site revealed parts of the abbey church as well as evidence of a crude but extensive industrial platform, probably for iron working, lying to the N and W of the main abbey buildings. NN 954 224 A short watching brief in April 2000 was carried out at Inchaffray Abbey, a Scheduled Ancient Monument near Madderty, during the excavation of post-holes for a rabbit-proof fence. An Augustinian priory was founded at Inchaffray around 1200 by Gilbert, Earl of Strathearn, and apparently replaced an earlier ecclesiastical establishment at that place. The abbey continued in use at least until 1561, and in 1609 became the seat of James Drummond, the first Lord Madderty. Now only the remains of the W range are visible. Excavation was limited to seven fence post-holes with a maximum depth of 0.7m, all located to the W of the standing remains of the abbey. Of note was the uncovering of a layer of sandstone blocks set in a clay-sand matrix under the topsoil to the E of the area. This may have represented a zone of demolition material, or possibly structural remains. Sponsors: Mr and Mrs Watkins. A fourteenth-century bronze seal-die bearing the inscription + S' COMVNE: ECCE: SCI: IOh'IS: EWANGELISTE: DE: INSVLA: MISSARVM ('Common seal of the church of St John the Evangelist of the Island of Masses') is now in the collections of the British Museum. On one face it depicts the saint standing within a church, and on the other a flying eagle. Information from RCAHMS (IFr), 28 July 2005. Edinburgh: Scottish History Society. 1908. (held in NLS). The National Library of Scotland, Edinburgh, contains, among the 'uncatalogued MSS of General Hutton' and numbered 111/ and 112. Vol.1, two sketches of 1781 and one of 1788, of this ancient Abbey which is now in ruins in Perthshire, situated on the bank of the River Barn, some 10 miles nearly West from Perth.